Ohio State Highway Patrol troopers take a man into custody after a pursuit in the Greenfield area. An area man was arrested Saturday after leading authorities on a chase down Rapid Forge Road, and two weekend car accidents kept emergency responders on their feet. 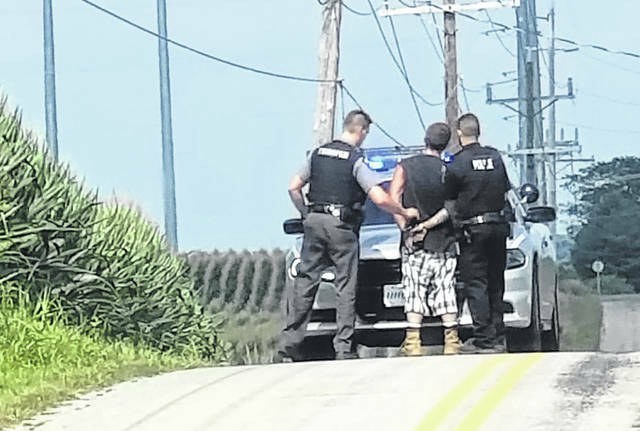 Billy J. Penwell, 27, was arrested after fleeing from police on Rapid Forge Road to a bean field on Lower Twin Road Saturday evening, according to Sgt. Jeremy Grillot of the Ohio State Highway Patrol Wilmington Post. Penwell, who told officers he lives on Lower Twin Road, was clocked going over the speed limit on Rapid Forge just north of U.S. Route 50 at about 4:15 p.m., Grillot said. When the trooper attempted a traffic stop, Penwell took off and didn’t stop until his vehicle ran out of gas in a bean field on Lower Twin, according to Grillot. Penwell then led officers on a brief foot chase before being apprehended, according to Grillot. Grillot said authorities found possible methamphetamine, rolling papers, some pipes and a scale in Penwell’s vehicle. Penwell was charged with failure to comply with the order or signal of a police officer, possession of drugs and possession of drug paraphernalia, Grillot said. 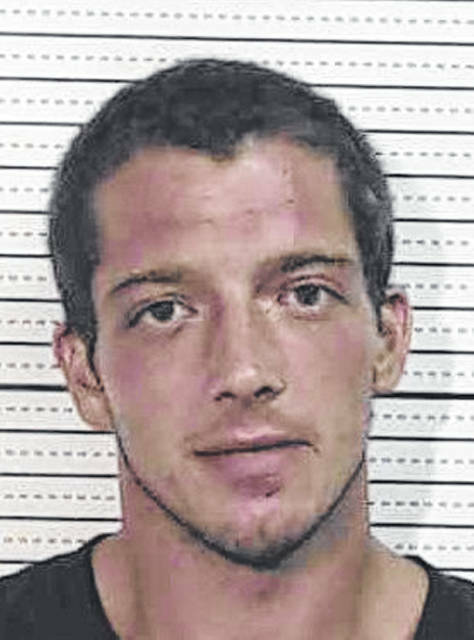 Penwell remained incarcerated Monday in the Ross County Jail on a $10,000 bond. Also Saturday, Darin Bentley, 52, Leesburg, was taken to Miami Valley Hospital by a medical helicopter after reportedly rolling his truck on Van Pelt Road north of the Village of Highland, officials said. Grillot said Bentley was traveling northbound on Van Pelt when his truck drove off the left side of the road, struck a ditch and overturned. Grillot said Bentley was not wearing his seat belt and ended up in the back seat of the extended cab of the pickup truck. Bentley was transported to Miami Valley with head injuries, Grillot said. The accident occurred just before 10 p.m. Saturday. No other vehicles were involved, Grillot said. There were no other occupants of Bentley’s vehicle. Another one-vehicle accident on SR 134 near Lynchburg caused a power outage in the area that lasted much of the night, according to Communications Officer Damon Haught of the Highland County Sheriff’s Office. Haught said a vehicle struck a utility pole on 134 north of Panhandle Road Sunday evening, cutting power to area homes. Haught said the power was out from about 9 p.m. Sunday to 6 a.m. Monday. Grillot said the vehicle was driven by Randall Peterson, 28, Lynchburg. Haught said an emergency squad was dispatched, but did not transport any patients. Both accidents remain under investigation, Grillot said. No charges have been filed.